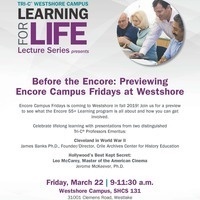 Tri-C’s Encore Campus Fridays is coming to the Westshore Campus in fall 2019. Join us for a preview to see what the Encore 55+ Learning program is all about and how you might get involved. Help us celebrate lifelong learning with presentations from two distinguished Tri-C Professors Emeritus. Read more about the Encore 55+ Learning program here. Free of cost. Space is limited. Reserve your spot today! This learning program best for http://www.aoneassignment.com students because they wants new things. A commonplace mistake is to trade one part of a training program with out thinking about its impact on other parts of this system.